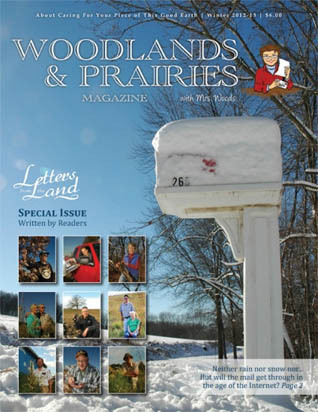 Welcome to Woodlands & Prairies Magazine - from Mrs. Woods! 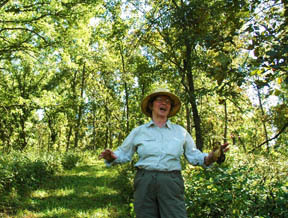 Land stewards are joining forces to get more work done. 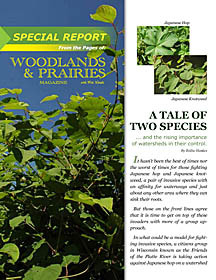 We recently ran a series of stories on group action to control Japanese knotweed and Japanese hop in watersheds. 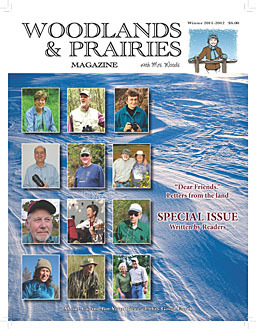 Download the reprint---A Tale of Two Species---here! We are not taking new subscriptions at this time, but please send me an e-mail if you'd like to keep in touch. We will let you know when we resume publishing. Meanwhile, let's bring back the prairies and restore oak savannas. 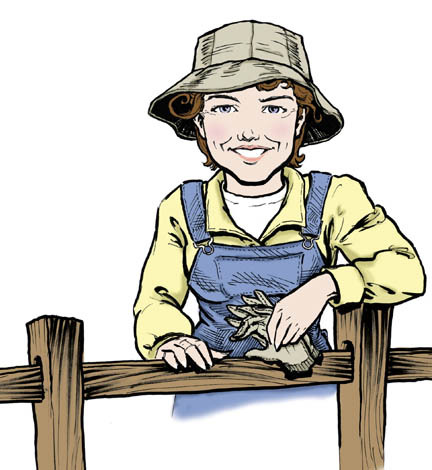 Let's make the wetlands wet, and replace sterile lawns with deep-rooted native perennials. Let's practice sustainable forestry and sustainable agriculture. Let's protect endangered plants and animals and preserve our natural heritage. 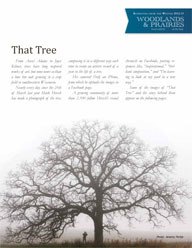 Yours for cleaner air, clearer water, richer soil, greater biological diversity and healthier food from healthier land. 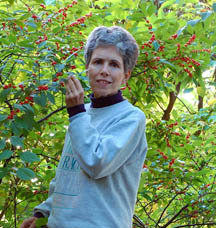 Janet Allen, Syracuse, New York, switched from plants that decorate her garden to native plants that provide habitat. 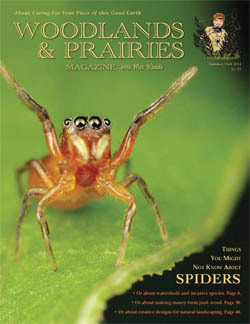 “I’m humbled to realize how important my little piece of earth can be, and that nothing less is at stake than the diversity of life itself.” ~ Woodlands & Prairies, Summer 2011. 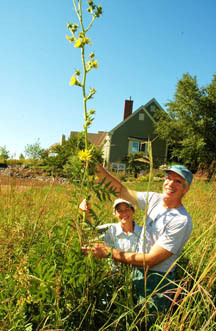 Doug and Betsy Lake joined their neighbors in Stillwater, Minn., to plant parts of their yards to prairie. "The plantings have brought us closer together as a community." ~ Woodlands & Prairies, Summer 2009. Keep up the good work. I think I might be in love with Mrs. Woods.---G. N., Browerville, Minn.
Loving it…Reading it…Learning from it…Thanks.---R. 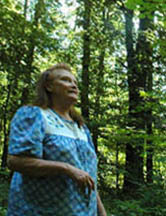 B., Blanchardville, Wis.
Jan Gibson became a leader in the Oak Openings restoration movement in northwestern Ohio after she learned that her yard in Holland, Ohio, contained the remnants of an important black oak/lupine savanna. "It was as if God led me to this place." ~ Woodlands & Prairies, Spring 2011. 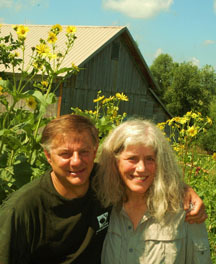 Steven Apfelbaum and Susan Lehnhard have dedicated their lives to restoring the ecological health of a worn-out 80-acre farm in southern Wisconsin. 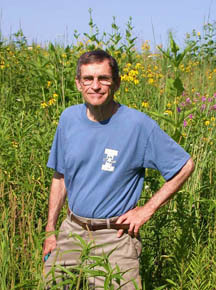 “The joy of restoring a small piece of the Earth cannot be overstated, but we long to see the example supported and encouraged elsewhere.” ---Steven Apfelbaum. 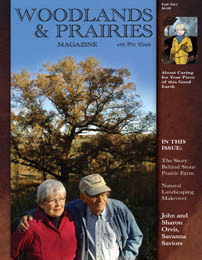 ~ Woodlands & Prairies, Fall 2011. 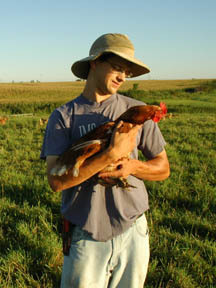 Galen Bontrager produces free-range chickens and grass-fed beef on his farm near Wellman, Ia. 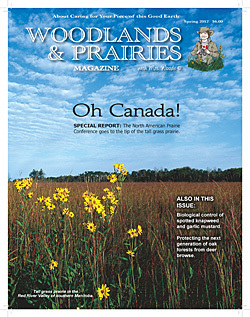 “I’m growing food in a way that’s good for consumers and for the land.” ~ Woodlands & Prairies, Summer 2008.